Prime Minister Erna Solberg delivered a tough message as her government gathered for its first budget conference of the year on Monday: Major spending cuts will be imposed unless the Norwegian economy lessens its reliance on the oil industry. The Norwegians call it “omstilling,” a word that literally translates to “readjustment or rearrangement.” It’s become a much-used word in Norway over the past year, especially since oil prices started falling late last summer. Now it’s being used constantly as Norwegians debate how the economy can switch over from reliance on the oil and gas sector to new ventures. “Things will get tougher (in Norway),” Solberg told newspaper Dagens Næringsliv (DN) Sunday afternoon before she headed on Monday up to a hotel on the lake at Hurdal, just north of the airport at Gardermoen, where she’ll huddle with her ministers until Wednesday. They’ll be formally launching the process that results in presentation of the government’s state budget proposal in the autumn. “Budget work is always an exhausting process, because there are so many good goals and so many important things you want to do,” Solberg told DN. She wouldn’t reveal any concrete proposals for next year’s budget, but confirmed that “omstilling” will be the key word once again. “What’s most important is that the budget must take us in the right direction regarding the challenges we see ahead, the omstilling (readjustment) we have to take,” Solberg said. Solberg has been criticized for “talking down” Norway’s huge oil and gas industry, by repeatedly claiming that Norway must move away from oil and gas and towards new industries. It’s not primarily because of climate issues and the need to cut emissions, but rather because oil and gas won’t generate the same amount of revenues that they’ve been pumping into the state economy, epecially over the past decade when oil prices soared. The money needed to fund Norway’s huge social welfare state is going to need to come from other sources. If those sources aren’t developed, major cuts will be needed in the social welfare system, Solberg warns. 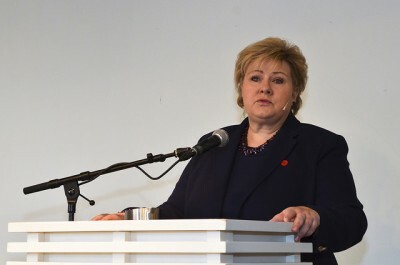 Shaking off the criticism, Solberg maintains that oil and gas won’t continue to be the locomotive for the Norwegian economy despite the discovery of huge new oil and gas fields like Johan Sverdrup. While she also has been criticized for continuing to open up new offshore areas for oil and gas exploration, not least in the environmentally sensitive Arctic, Solberg is keen to develop new job prospects in other sectors. Her government’s budget, she noted, can “set the framework” for business in Norway through taxes and fees, public sector investment and funding for such things as infrastructure projects, education and development of competence. “The goal is to preserve our welfare system, to make sure there are good, secure jobs for folks that in turn can finance it,” she told DN.